Narendra Modi's economic vision has much in common with that of former prime minister Atal Bihari Vajpayee. 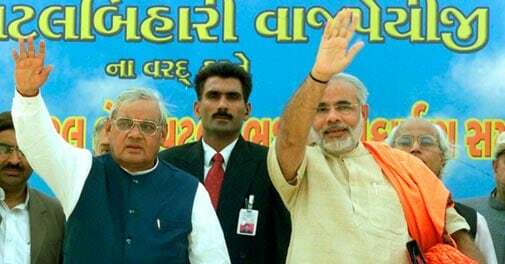 A Reuters file photo of former Prime Minister Atal Behari Vajpayee (left) and Gujarat Chief Minister Narendra Modi at a gathering in Bhuj, Gujarat on January 14, 2004. On an October morning in 1998, then Prime Minister of India, Atal Bihari Vajpayee, called his finance minister Yashwant Sinha to discuss a 'big idea' before his address at FICCI, one of the two largest industry bodies in the country. Vajpayee wanted to put forth an idea to key business leaders that would capture their imagination. That's when he first pitched the idea of connecting the country through a network of highways. "The government will start within this year and from twenty different places from across the country work on a major 7,000-km road project," he told a FICCI gathering on October 24, 1998. At the time, the proposal by the Vajpayee-led government to connect the entire country through highways and roads was considered audacious. "People made fun of Vajpayee. They would ask where the money will come from," says Sinha. "There were several challenges, including land acquisition issues." The Rs 54,000-crore project - currently underway - was initially funded through an additional Rs 1 cess on petrol and diesel. Fifteen years later, reactions are somewhat similar to BJP's prime ministerial candidate Narendra Modi 's vision for India which includes interlinking rivers, introducing bullet trains, modernising railways and building gas grids, optical fibre networks and a hundred smart cities. It will cost the exchequer some Rs 20 lakh crore. Interlinking rivers is an idea that took shape in the Vajpayee era in 2002 - it seeks to link 14 Himalayan rivers in North India and 16 peninsular rivers in South India - but was put on the backburner after the Congress-led UPA came to power in 2004. "The idea has the potential to prevent floods and droughts, provide new sources of hydropower and irrigate millions of hectares of land," says Vinayak Chatterjee, Vice Chairman of Feedback Infra, a leading integrated infrastructure services company. At an awards function in New Delhi on January 17, Modi also spoke with conviction on how future cities would come up around optical fibre networks and emphasised that science and technology would lay the foundations of modern India. His audience included doyens of the IT industry, including Shiv Nadar, Kiran Karnik, Vineet Nayyar and C.P. Gurnani. "I am not a fan of Modi or his party but he seems to understand innovation," says a senior IT company executive who did not want to be named. Modi's vision document seems to be in sync with what Vajpayee began. While Vajpayee started the process of laying the building blocks of the nation through roads, highways, linking of ports, etc, Modi is taking that vision forward by focusing on information highways. "Vajpayee was the first prime minister who thought about linking all rural roads to all the major markets of the country. When you plan nationally, you need to have an understanding of the grassroots and Modi is a man of development himself. He clearly has the vision," says Suresh Prabhu, former power minister in Vajpayee's cabinet. Modi's followers say that his vision for India is based on what he has delivered in Gujarat. For instance, there are about 125 smart city projects underway in the state. Smart cities are connected through IT as well as through traditional roads and highways. But Modi's ideas have been panned by critics for being too far away from the realities of India and not necessarily original. Bullet trains, for instance, are prohibitively expensive and the idea has been in the pipeline for many years now. There is already a plan in place to provide broadband connectivity to over 200,000 gram panchayats by expanding India's optical fibre network. A proposal by Modi to provide real time data on agriculture was termed redundant by prominent agri economists as tracking output using satellites is considered unviable in India where farm sizes are small. But then experts also say this is the first time after many years that infrastructure is finding its way back into the main political discourse and conversation is moving away from entitlement based incentives. "I am happy that interlinking of rivers is being spoken about again. It is a programme that could have four times the impact of national highways. All these ideas can lead to huge employment generation. I give them full marks for saying these things," says Chatterjee. Others are more cautious. "All of this sounds very good, but unless you fill in the gaps and spell out the details, it can all very well be rhetoric," says Rajiv Kumar, Senior Economist at Centre for Policy Research. Vajpayee had the unmatched ability to take people along with him on crucial decisions. It is a trait Modi will need to work on to execute his vision.